Sometimes we need to forget in order to forgive. Unfortunately, when it comes to offenses, we often have very good memories. As I was growing up, my parents were both alcoholics. My mom finally got sober and involved in AA before my first child was born. I rejoiced when this happened, but it took some time before the feelings of hurt and resentment were gone. In AA they celebrate anniversaries of one’s sobriety. My mother asked me to come and celebrate her first anniversary, which I was glad to do. However, I found that it was hard on me emotionally, because there was a lot of talk about my mother’s alcoholism. For me it was like picking at a wound that hadn’t healed completely. When my mother became aware of my feelings, she accused me of not being honest in saying I had forgiven her. I explained to her that the way I was walking through forgiveness was by not dwelling on the past. After all, God deals with our sin that way. He says, “As far as the east is from the west, so far has He removed our transgressions from us” (Psalm 103:12, NKJV). 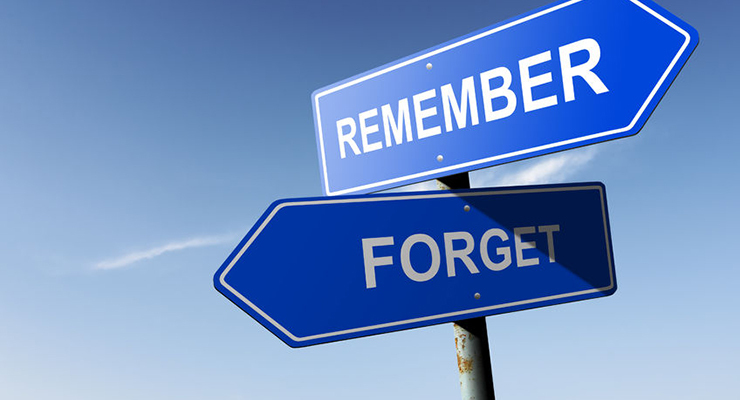 He also says that He will not remember our sins (Isaiah 43:25). In one of Corrie Ten Boom’s books, she tells of having a visit from a man who asked her if she’d forgiven a hurt by a friend. Corrie said she had and then offered to show the man letters that documented the offense. He chastised her and told her that, if she was still holding onto those letters, she had not really forgiven. You see, when you dwell on a hurt or talk to others about it, you are practicing it. What happens when you practice something? You get to know it better, right? Take practicing for a part in a play. You memorize your lines by going over and over them. Why? So you’ll remember them. That’s pretty much the opposite of forgetting, I’d say. Praise the Lord, when I went back for my mother’s tenth AA anniversary, I could join wholeheartedly in the celebration. And this year, in a BSF (Bible Study Fellowship) lesson I was asked what about my life would I change if I could do so. I realized that I don’t think I would change anything (besides my own sins), including my parents’ alcoholism, for this was among the things that shaped me and made me who I am today. Thank You, Lord, that because of Your Son, You don’t remember my sins! Help me to have a very poor memory regarding offenses, but a great one to remember all Your many blessings! Thank you so much for your blog I cannot tell you how many times your blog has help me with my daily life. I myself as I have lost my mother, I was 35 when my mother died, and I look for the wisdom of older women to help me with raising my family and my marriage and being a strong Christian woman. Thanks for your sweet words. I’m so glad the blog has been an encouragement to you! My desire is for the Lord to use it to encourage other women. I appreciate hearing from you!